Scrub Club - health and hygiene activities for kids!! Kids can learn about health and hygiene at the Scrub Club™ web site. The site features a fun and educational animated Webisode with seven “soaper-heros” who battle nasty villains representing germs and bacteria. Kids learn the six key steps to proper handwashing through a webisode, a handwashing song, interactive games, and activities for kids. Educational materials for teachers are also available to download. Influenza (flu) is a contagious respiratory illness caused by influenza viruses(http://www.cdc.gov/flu/about/viruses/index.htm). It can cause mild to severe illness. Serious outcomes of flu infection can result in hospitalization or death. Some people, such as older people, young children, and people with certain health conditions(http://www.cdc.gov/flu/about/disease/high_risk.htm), are at high risk for serious flu complications. The best way to prevent the flu is by getting vaccinated each year. The upcoming season's flu vaccine(http://www.cdc.gov/flu/about/season/index.htm) will protect against the influenza viruses that research indicates will be most common during the season. This includes an influenza A (H1N1) virus, an influenza A (H3N2) virus, and one or two influenza B viruses, depending on the flu vaccine. A summary of key seasonal flu facts and who should get vaccinated. Information about the 2014-2015 flu season. Information about past flu seasons. Flu symptoms and how some people are at greater risk from severe complications. Some people are more likely to get flu complications that result in being hospitalized and occasionally result in death. General information on regular flu seasons in the United States. 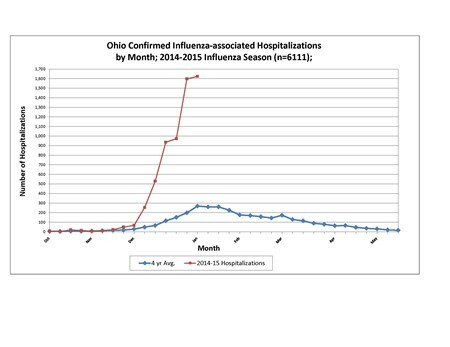 The Ohio Department of Health tracks seasonal influenza activity on a weekly basis throughout the year. ODH monitors circulating flu viruses and other related data sources and provides weekly summaries of influenza activity from October (Week 40) through May (Week 20). The first week of the new calendar year is indicated by "Week 1." According to the CDC, hand washing is the single most effective way to prevent the spread of contagious diseases when done correctly. Some viruses may be hardy and relatively resistant to disinfection with alcohol rubs, but hand washing with soap increases contact time, facilitates friction, and dissolves grease and dirt, which contain high concentrations of microbes. *WET your hands with clean, running water (warm or cold), turn off the tap,R and apply soap. *LATHER your hands by rubbing them together with soap. Be sure to lather the backs of your hands, between your fingers, and under your nails. *SCRUB your hands for at least 20 seconds. *RINSE your hands well under clean, running water. *It's that time of year again! School nurses are reviewing immunization requirements for school attendance (mandated by the Ohio Department of Health). Please make sure your child's immunizations are up to date and their school nurse has an updated copy of the record. BLOODBORNE PATHOGENS *OSHA* PRESENTATION: Review presentation, print off quiz: sign your name, date, and take the quiz. -Turn into the supervising nurse for your certificate.